"Providing Peace of Mind...at Home"
Alison Starkey PT MBA/MHA CAPS CDP is a licensed Physical Therapist in North and South Carolina who brings over three decades of experience. We provide skilled in-home physical therapy services and have worked in hospitals, nursing homes and rehabilitation facilities. Alison has extensive experience dealing with those with dementia and is a Certified Dementia Practitioner. Whether you're recovering from a broken hip or you're worried about your parent in a nursing home, you'll get the help you need from Gaitway of Charlotte. All of the consultants that work with Gaitway of Charlotte are licensed and experienced Physical and Occupational Therapists. 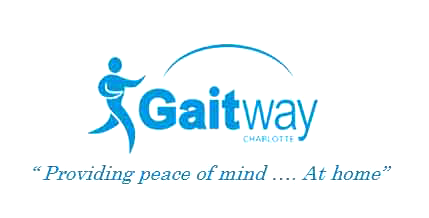 Gaitway of Charlotte was formed in 2012 by Alison Starkey PT MBA/MHA CAPS CDP, Licensed Physical Therapist and Certified Aging in Place Specialist (CAPS). Gaitway provides consulting services to the Greater Charlotte area on how to enable older individuals to remain in their homes - safely - while not just surviving but thriving with the greatest quality of life possible. We aim to provide you with the PEACE OF MIND that your loved one is safe and happy... in their home. Gaitway has a team of qualified and skilled consultants with years of experience in the rehabilitation industry who knows what goods and services really work, and what doesn't. Since being open, we have grown into a trusted resource for home safety consultations. Call 1-833-GAITWAY now to make an appointment. The physician of a senior whose family is reluctant about a nursing home? The caretaker of a senior who's dealing with a prolonged illness or disease? Interested in creating a safer and more comfortable home for your golden years? Whatever issue you might be facing, you've come to the right place. Gaitway of Charlotte wants to offer you compassionate, sensitive assistance. We believe you deserve hands-on care from a dedicated specialist, and that's exactly what we can provide. Schedule a consultation with Gaitway of Charlotte by calling 1-833-GAITWAY today.